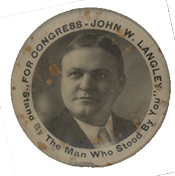 LANGLEY, John Wesley, (husband of Katherine Gudger Langley), a Representative from Kentucky; born in Floyd County, Ky., January 14, 1868; attended the common schools; taught school for three years; attended the law department of the National, Georgetown, and Columbian (now George Washington) Universities in Washington, D.C., for an aggregate period of eight years; examiner in the Pension Office and a member of the Board of Pension Appeals; law clerk in the General Land Office; disbursing and appointment clerk of the Census Office 1899-1907; served in the State house of representatives 1886-1890; elected as a Republican to the Sixtieth and to the nine succeeding Congresses and served from March 4, 1907, until January 11, 1926, when he resigned; chairman, Committee on Public Buildings and Grounds (Sixty-sixth through Sixty-eighth Congresses); resumed the practice of law in Pikeville, Ky., where he died on January 17, 1932; interment in the Langley Cemetery at Middle Creek, Ky.
Papers: February 13, 1922. 1 letter. Finding aid in repository.